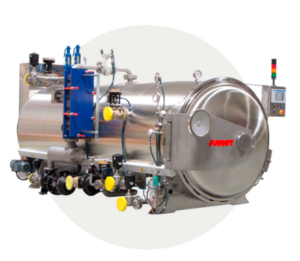 In Surdry, we will answer to ‘What is an autoclave or a retort?’ It is a hermetic metallic vessel, cylindrical, vertical or horizontal, prepared to work under internal pressure. The pressure is necessary to be able to work at more than 100ºC (212 F) using steam as a heating medium. In the food industry they are used for the sterilization of canned and hermetically packed foods whose characteristics require a treatment above 100 ºC (212 F). The thermal treatment of food is carried on to destroy or reduce some microorganisms which can develop toxins or fermentation. An effective reduction of those microorganisms can extend packed food shelf life up to several months or even years, depending on its conservation and treatment. If we look at the wood industry they are used to treat wood for outdoor constructions and thus protect it from parasites. In the textile industry, the retorts are used for dyeing the fabrics. If we talk about the rubber industry, we say taht they are used to perform vulcanization. In the treatment of hospital waste, they are used to eliminate existing pathogenic microorganisms. A more recent application is in composite materials field to perform bonding process to stabilize them. On example of such materials can be the carbon fiber, which is used in aeronautical and car industries. Pressed glass is also treated in retorts to make it more resistant to impacts. We hope to have detailed the answer of the question ‘What is an autoclave?‘ and its usefulness in different industrial sectors. Contact Surdry to request more information.